Online advertising fraud—primarily in the form of bots designed to rack up bogus clicks on display ads—continues to pillage the digital landscape like a swarm of enormous mechanized mosquitos, draining advertisers of up to $11 billion a year. 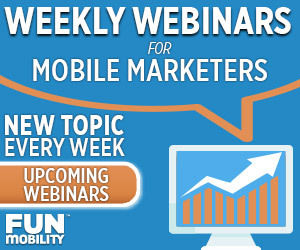 In February, IAB chairman Vivek Shah announced that as much of 36% of all web traffic is non-human. 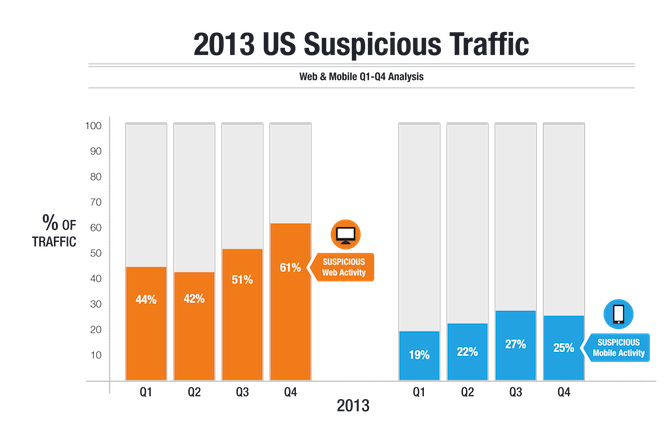 According to a study by Solve Media, the number is even higher: with 61% of desktop traffic deemed “suspicious” in Q4 of 2013. The New York Times ran an article in May lamenting the sorry state of online video ads. Every day, new technologies and new companies pop up promising better anti-fraud optimization, yet the numbers continue to grow more disparaging. But what to do? It’s not like modern marketers can just ignore their digital advertising channels. Even with the high percentage of fraudulent clicks, it’s suicide to throw away the enormous audience reach made possible by serving ads on desktop and mobile devices. 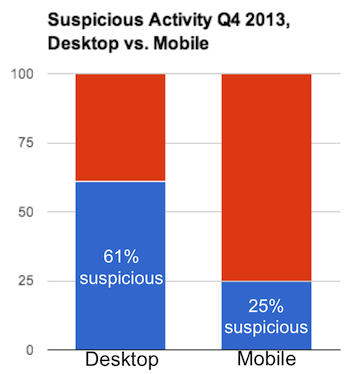 While online advertising fraud is still certainly a problem on mobile, it’s less than half as prevalent as it is on desktop—with Solve Media reporting only 25% suspicious activity on mobile in Q4 of 2013, vs. 61% on desktop. This makes mobile a fundamentally safer channel to invest in, albeit one that carries its own considerations and best practices for maximizing ROI. But if Solve is correct, and 25% of all mobile activity is suspicious, then the risk is still unacceptably high for many advertisers. Also, in all likelihood, it’s only going to get worse. With global mobile ad spend growing by 50% annually, mobile ads will inevitably become a greater focus for fraudsters looking for a new source of stolen revenue. So, while prioritizing mobile is a smart place to start, it still isn’t a complete solution for combatting fraud. While premium ad networks are worlds safer than the junk overflow inventory you get with blind networks, even the best network isn’t immune to the occasional bad apple. The digital ad ecosystem is so complex, publishers themselves are often unaware that they have become the source of fraudulent activity. While the day may yet come when software alone can fix online advertising fraud, at present there is no substitute for plain old due diligence. Don’t take your success for granted. If the click-through rate for your campaign is unusually high, that doesn’t necessarily mean it’s time to pat yourself on the back for an ad well run. Too many advertisers only look closely at publishers that perform poorly—but it’s also a good idea to examine publishers that perform too well. If half of your clicks are coming from one IP address, then guess what? That’s not an enthusiastic audience. But it’s not always that obvious. After all, maybe the publisher really is just a great fit for your brand, and the higher CTR is genuine. How to know for sure? At FunMobilty, one of the ways we weed out bot activity is by tracking consumer engagement. This metric includes all activity that happens post-click, when the consumer is interacting with one of our expandable mobile rich media ads. Mobile rich media advertising is much harder for bots to exploit, thanks to the inherently more sophisticated feature set (i.e. touchscreen functionality). Because of this, it’s easier to identify fraudulent clicks and optimize a campaign accordingly. Sites and apps delivering high CTRs but zero engagement obviously don’t reflect human behavior. This fix is a win-win: use geo-targeted ads. Most fraud comes from sources in Asia and Eastern Europe, and the fraudsters have no way of identifying the targeting parameters are for an ad they’re exploiting. This means you can instantly tell when and where fraudulent clicks are coming from—because they’ll likely be outside the radius of your geo-targeting. FunMobility offers a reporting feature called “Eagle Eye” to help with this: it provides a map to visually represent the exact geographic location of everyone engaging with your campaign. If any activity is happening far outside of your targeting requirements (like, say, in Indonesia), then it’s probably fraudulent. Geo-targeting makes it much easier to identify online advertising fraud. Here’s the inconvenient truth regarding online advertising fraud: nobody’s incentivized to actually fix it. Publishers benefit by charging for bogus activity. Agencies and ad networks benefit by showing their clients above-average results. And brand managers can be so far removed from the action that they’re blissfully unaware it’s even happening. But it’s obviously a serious issue with long-term destructive consequences for the entire industry. Even after all these years, digital advertising is still very much the wild west. And just like the wild west, integrity is sometimes in short supply. That’s why it’s so important to seriously vet everyone you partner with. If you’re relying on an outside agency or network to protect you from bots, make sure you know exactly how they plan to do it—and make sure they offer the transparency to back up their claims. If you’re relying on software to beat the fraudsters, make sure you augment your efforts with actual human diligence. Updated monthly, the IAB (Interactive Advertising Bureau) maintains a list of publishers and IP addresses that are known sources of fraud. You can check it out by clicking here. One solution I’ve seen proposed time and time again on blogs and industry news sites is for publishers to shift their billing model from the traditional CPM (charging by display ad impressions served) or CPC (charging by clicks) models to something that requires verification of actual human engagement. A bot, for example, can be programmed to click on a digital display ad fairly easily—but it’s much more difficult to create a bot that can engage with the display ad’s unique post-click layer. But there’s a critical problem with this solution: it requires publishers to accept all the risk. If they provide ad real estate to serve ads that, for any number of reasons, fail to drive the defined consumer action, then they’re giving away that ad space for free. A poorly-designed display ad, for example, would cost publishers money. The only way to compensate for this would be to charge a dramatically higher CPA—making it questionable whether or not advertisers would actually see an increased return on investment.